An IIPM Think Tank consulting journal of case studies. A HUMAN FACTOR Quarterly supplement. 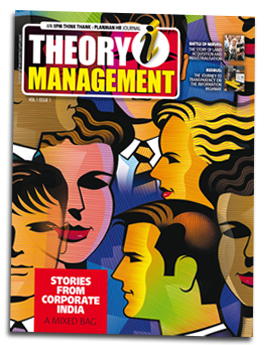 Theory i Management is an IIPM Think Tank publication, covering India-centric case studies in different domains of management. It is published quarterly and is currently circulated along with another IIPM Think Tank magazine - The Human Factor. The Theory i Management covers case studies written by IIPM professors on original management issues in Indian organizations, with research inputs from IIPM students and research scholars.